Appearance (0-20): The sun grown Sumatra wrapper shows off some nice deep color. The wrapper itself is rich and oily to the touch, with no visible blemishes. Actually there weren’t even any major veins to speak of at all, just a few minor ones. The label holds the standard Rocky imagery along with a second band to proclaim this is the Sun Grown variety… but both have a really nice simple gold and red color combination. Construction (0-20): Rocky’s cigars are normally well constructed, but you do get a dog or two from him. When I began I was happy to say I was on the correct end of things with this one (foolish me for making assumptions). The tobacco felt relatively evenly placed and upon cutting there was only a small amount of residual tobacco. It lit up with no issues and had a favorable draw, but there were some points that the draw became a bit tighter than I would have preferred. The ash (regardless of what I am going to say after) held on for over an inch and a half each time. The odd thing, for me at least, was that the first third of the cigar burned really evenly, but as it progressed the burn went completely haywire, causing quite a few headaches to try and touch up… Then in the last third things evened out again just fine. Weird. Strength (0-20): Labeled as a medium to full bodied cigar, I was happy to see it did actually stick pretty well in that range. However it definitely begins with a strong touch and then gradually levels off to the medium range. Flavor (0-20): While I have heard a lot of good things being said about the RP Sun Grown, I personally was not a huge fan of it. The first third is heavy on the pepper, almost to the point where it is a little too harsh for its own good. It begins to level down very quickly, however, and becomes much more of a creamy and nutty experience with an undertone of pepper. In the second third a slight cedar taste creeps in, but the taste is very dry to the palette. When you hit the final third hits you end up looking for some manner of refreshment, only to find yourself knee deep in pepper again. Value (0-20): At $8.00, the Sun Grown is creeping into the area that there are too many really good cigars to try and compare it to. It’s a little pricey for what you get, but not awful either. Overall (0-100): Looking back at my cigar experience, I think I would simply categorize it as a disappointment. 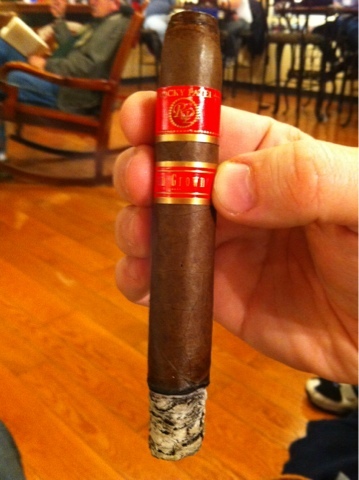 I really wanted to like this cigar because I really do enjoy the peppery stuff – but this one fell short for me. It lacks real complexity, is a bit dry, and comes off as generally a little harsh. But even without the taste issues, there were some construction items to deal with too. But for the price, this isn’t the stick I want to be spending my money on.